In Part One of the Full Scale Revolution series we covered groups within the U.S. that are calling for a revolution, violence as a means of protest and how former Obama officials, such as his former Attorney General Loretta Lynch and for Secretary of State Hillary Clinton, are agitating, calling for "resistance," and continued violent protests which might lead to blood and death, with Obama spokesman also quoted as saying he was "heartened" by the protests against the Trump administration. Today, we note a number of other powder kegs within America that are ready to blow, including, cities, jurisdictions, and in some cases states, that are considered "sanctuary cities" also have the largest amounts of "refugees," that have resettled within them, and multiple states have known Islamic compounds, armed to the gills, and preparing for war against the Trump administration. 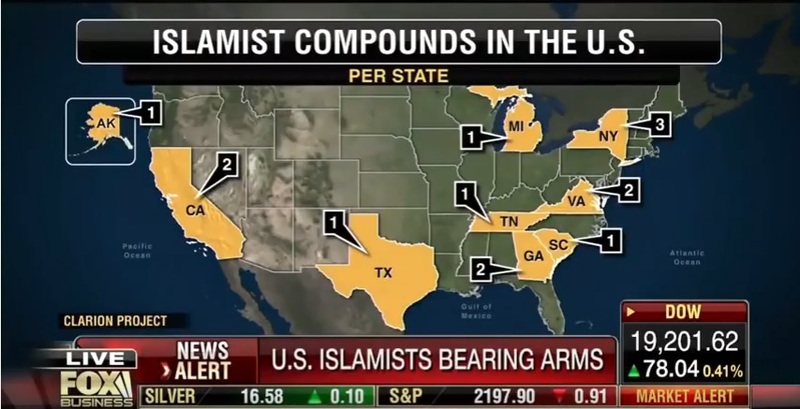 The image above shows the states that have known armed Islamic compounds, the numbers next to those states indicate how many training compounds are within that state. According to Clarion Project's national security analyst, Prof. Ryan Mauro, these are armed terror-linked Islamic groups operating training compounds within the US and preparing for war against the Trump administration. The next map shows where the 84,995 refugees imported into America between Oct. 1, 2015 – Sept. 30, 2016, called Fiscal Year (FY), 2016, were resettled. 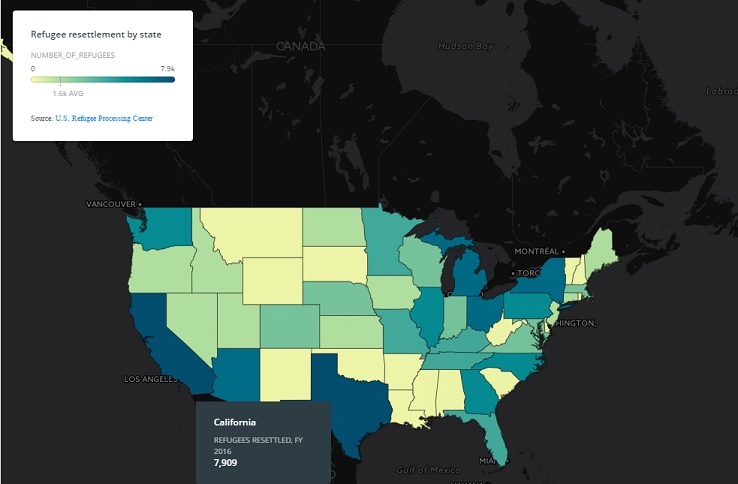 The website with the original map did not offer the option to embed the interactive version, so click here and mouse over the states for the official numbers, to verify the data highlighted below the map, showing how many "refugees" were resettled in each of the states that have armed Islamic compounds in the U.S.
California: Refugees resettled - 7,909/ Texas: Refugees resettled - 7,802/ New York: Refugees resettled - 5,026/ Michigan: Refugees resettled - 4,258/ Georgia: Refugee resettled - 3, 017/ Tennessee: Refugees resettled - 1,959/ Virginia: Refugees resettled - 1. 471/ South Carolina: Refugees resettled - 350. Note that those are just the states that have known Jihad camps located within and those numbers only represent "refugees" imported for the fiscal year 2016 alone, not those resettled prior to that. Other states, represented in the map below, of states with multiple cities and jurisdictions that are considered "sanctuary cities," where they have have laws, ordinances, regulations, resolutions, policies, or other practices that obstruct immigration enforcement and shield criminals from ICE," are also shown to have significant numbers of refugees that were resettled in FY 2016. The Center’s last map update reflected listings in an ICE report published on March 20, 2017. As you may have noticed, states like Washington and Oregon have clusters of sanctuary jurisdictions, and also large numbers of refugees resettled within those states as well. 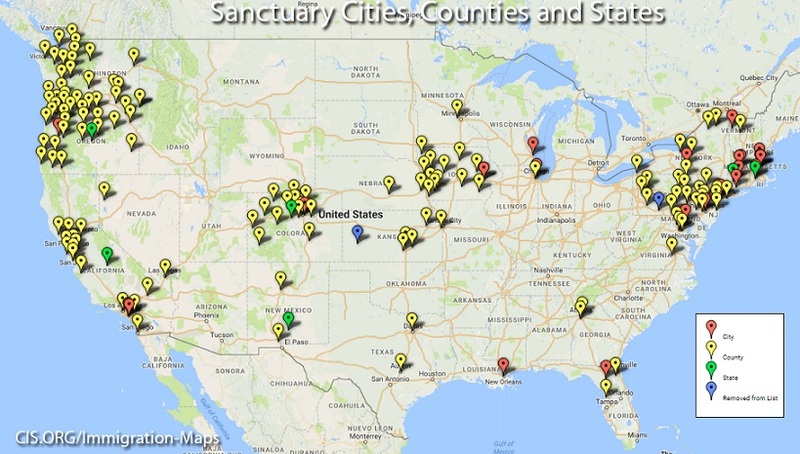 What we have here is a number of jurisdictions that are sanctuary cities, have also been receiving an influx of "refugees," many of which show high levels of those refugees have been imported into states that have armed Islamic camps with people training for a "war" against the Trump administration. A prepositioned army of Middle Easterners all inside American borders. Perhaps now would be a good time to ask just where all those military grade weapons, tactical gear, body armor and ammunition that the Obama administration was busy stockpiling, went to? I don't mean what "agencies," since we have agencies that do not have a security force receiving the equipment for some reason, but what states did it all go to? In 2015 it was reported that ISIS and other terror groups were using the refugee program to "infiltrate the west," and by early 2017, they had found "success infiltrating its terrorists into refugee flows to West." The Islamic State, also known as ISIL and ISIS, has inspired followers to commit atrocities in San Bernardino, California; Orlando, Florida; and the Fort Lauderdale airport in Florida. Knowing that, one has to ask why the Obama administration would allow 84,995 refugees to be resettled in 2016 alone, which is the the largest number of admissions since 1999? The Obama administration also refused to provide Governor of states that refugees were resettled in, information regarding those refugees. In a call with senior Obama administration officials Tuesday evening, several governors demanded they be given access to information about Syrian refugees about to be resettled by the federal government in their states. Top White House officials refused. Which brings up another point highlighted earlier in this article where Clarion Project's national security analyst, Prof. Ryan Mauro highlighted the fact that the FBI was not sharing information on a local level about the Jihad compounds in the U.S., because the FBI also dropped the ball on people within the U.S. that were under investigation, then went on to commit terror attacks on U.S. soil. Just this last weekend we saw reports that the terrorist shooting in Garland, Texas during a "draw Muhammed" contest, had been under FBI investigation, with agents actually posing as an Islamic radicals and communicating with one of the shooters, and were tailing them the day of the shooting, yet they did nothing to prevent the attack whatsoever, because of "complexities." So here's the real clarity in this story: at the time of the Garland attack, as the two terrorists, Elton Simpson and Nadir Soofi, were traveling in their car loaded with guns and ammo, they were being closely tailed by an undercover FBI agent (not an informant -- an actual FBI agent) whom they had previously been in contact with on social media. In fact, FBI involvement and investigations into terrorists that successfully carried out their attacks on American soil, has been a recurring theme over the course of Obama's term, as shown below. 2009 Little Rock recruiting office shooting: took place on June 1, 2009, when Carlos Leon Bledsoe, opened fire with a rifle in a drive-by shooting on soldiers in front of a United States military recruiting office in Little Rock, Arkansas. He killed Private William Long and wounded Private Quinton Ezeagwula. Bledsoe had been under investigation by the FBI's Joint Terrorist Task Force since his return from Yemen. 2009 Fort Hood shooting: A mass shooting took place at Fort Hood, near Killeen, Texas. Nidal Hasan, a U.S. Army major and psychiatrist, fatally shot 13 people and injured more than 30 others. ABC News reported that "The FBI was too concerned about political correctness and did not launch an investigation into a man who was later charged with killing 13 people in the 2009 attack in Fort Hood, Texas, despite significant warning signs that he was an Islamic extremist bent on killing civilians, according to a lawmaker briefed on the new report." Key Quote: "two FBI anti-terrorism task forces saw emails between the Army psychiatrist and al-Awlaki beginning in December 2008." 2013 Boston Marathon Bombing: On April 15, 2013, two homemade bombs detonated 12 seconds and 210 yards apart at 2:49 p.m., near the finish line of the annual Boston Marathon, killing three people and injuring several hundred others, including 16 who lost limbs. One of the terrorists that placed those bombs, Tamerlan Tsarnaev, had been investigated by the FBI on at least two occasions, prior to the Russian government warning the U.S. in March 2011 that said he appeared to be radicalizing. Are we seeing a pattern here? If not, then how about the fact that five U.S. agencies also vetted one of the San Bernardino shooters before allowing her in the country under the K-1 visa program, before her and her husband killed 14 people and seriously wounded 22 others. Perhaps one of the most extreme examples is the Pulse Nightclub shooting where 49 people were massacred and 53 others were wounded by Omar Mateen, who the FBI had investigated and interrogated on two occasions, during the three years prior to the attack, on suspicion he might have been a radical Islamic terrorist. Without a warrant, they couldn’t read his emails or listen to his calls. So the FBI and U.S. intelligence agencies couldn't obtain a warrant on a man suspected of being a radicalized Islamic, one who ended up killing 49 people and injuring 53 others, couldn't listen to his calls or emails, yet now we see the Obama administration had absolutely no problem surveilling the Trump transition team before he was inaugurated, had no problem "unmasking" American citizens, meaning documenting the names, had no problem issuing an Executive Order so that information could be widely disseminated throughout the intel community, so that those loyal to him that he planted all through his administration could leak them to the press. In part one of this series, we spoke about Barack Obama's Pastor, Jeremiah Wright and his many "anti-American" sermons, which we showed a compilation clip of, but what many might be surprised to know is that Wright has asserted that Jesus was Muslim, claiming "Jesus was a Palestinian," as well as claiming that Yahweh is Allah. This is part of the Black Liberation Theology that Wright spent over 20 years preaching while Obama sat in his pews at Trinity United. What will be even more surprising to many because the MSM didn't report it, is seen in a very old New Republic piece, which states "Wright was a former Muslim and black nationalist." During Obama's presidency it was consistently pointed out that no matter how many radical Islamic terrorist attacks occurred, whether in other countries of on U.S. soil, he would never utter the term "radical Islam" or "Islamic extremist," despite the perpetrators being proven to be radical Islamic extremists, but when you consider Wright's teachings, how many years Obama spent learning under the man he called a "good friend," and a "spiritual guide," as well as saying Wright "represents the best of what the black church has to offer," you start to see a pattern which explains his subsequent actions, like disallowing intelligence and surveillance of Mosques. It explains why the Obama administration "purged" more than 800 pages of reports by former Department of Homeland Security officer Philip Haney, because the terminology within those reports were "an offense to Muslims." It explains why Obama appointed Jeh Johnson, a man with a radical family tree, as the Secretary of Homeland Security, who made it a practice as part of Muslim outreach to associate with Islamic organizations with that are known fronts for Muslim Brotherhood. It explains why John Brennan, the Director of the Central Intelligence Agency under Obama, was ordered to purge all mention of Islam and jihad from law enforcement counter-terror training materials, when he was the assistant to the president on National Security for Homeland Security and Counter Terrorism, after Islamic groups delivered a letter demanding he do so. Also read: "John Brennan Is Wrong About Islam: Jihadists are Certainly Muslims" and "FBI training material purge likely caused agency to drop the ball on Orlando jihad mass murderer"
It is explains why James Clapper, who was Obama's director of national intelligence, claims Trump's travel pause in order to review the vetting process and make them more stringent, would be a "tool" for Jihadi recruitment, despite the fact that Clapper himself has previously admitted the U.S. cannot vet the refugees. It was also Clapper that attempted to claim that "climate change" was responsible for Islamic terrorism. 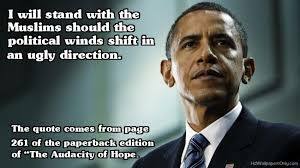 See more on clapper at Counter Jihad. We could go on about Obama's closest advisor Valerie Jarrett and her radical communist ties, or how Barack Obama kept a list of Muslims for top jobs, while excluding non-Muslims, which was revealed by Wikileaks in the Podesta emails, or how he planted multiple other radical Islamic supporters or sympathizers throughout his cabinet, the military, and intelligence agencies, or how an Obama appointed Hawaii judge blocks Trump's attempt to protect the country from travelers from countries with high levels of terrorist activities, but I think the picture has already emerged. On one hand we have multiple states where refugees and Jihadists pretending to be refugees, have been imported into without giving the law enforcement or Governors of those states critical information that could help them prevent the next terror attack, as well as radical Islamic compounds in many of those states, where their members and families are actively training and planning to go to war against the Trump administration, with countless Obama appointees in all sectors of the government appearing to be supporters of radical Islam or at least sympathizers. On the other hand we have Obama, Clinton, Lynch and other Obama officials encouraging and agitating communist groups to riots and spill blood in the streets to battle the Trump administration. Between the two we have powder kegs, strategically placed all over the country, all preparing for a full scale revolution in America. One spark hitting the wrong spot and it is all going to blow.